Show Up and Let Yourself be Seen Is vulnerability the same as weakness? “In our culture,” teaches Dr. Brené Brown, “we associate vulnerability with emotions we want to avoid such as fear, shame, and uncertainty. Yet we too often lose sight of the fact that vulnerability is also the birthplace of joy, belonging, creativity, authenticity, and love.” On The Power of Vulnerabi Show Up and Let Yourself be Seen Is vulnerability the same as weakness? “In our culture,” teaches Dr. Brené Brown, “we associate vulnerability with emotions we want to avoid such as fear, shame, and uncertainty. Yet we too often lose sight of the fact that vulnerability is also the birthplace of joy, belonging, creativity, authenticity, and love.” On The Power of Vulnerability, Dr. Brown offers an invitation and a promise - that when we dare to drop the armor that protects us from feeling vulnerable, we open ourselves to the experiences that bring purpose and meaning to our lives. Here she dispels the cultural myth that vulnerability is weakness and reveals that it is, in truth, our most accurate measure of courage. “The Power of Vulnerability is a very personal project for me,” Brené explains. “This is the first place that all of my work comes together. This audio course draws from all three of my books - it’s the culmination of everything I’ve learned over the past twelve years. 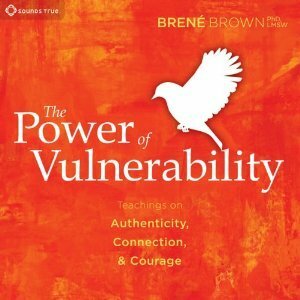 I'm very excited to weave it all into a truly comprehensive form that shows what these findings and insights can mean in our lives.” Guidance and Insights for Wholehearted Living Over the past twelve years, Dr. Brené Brown has interviewed hundreds of people as part of an ongoing study of vulnerability. “The research shows that we try to ward disappointment with a shield of cynicism, disarm shame by numbing ourselves against joy, and circumvent grief by shutting off our willingness to love,” explains Dr. Brown. When we become aware of these patterns, she teaches, we begin to become conscious of how much we sacrifice in the name of self-defense -and how much richer our lives become when we open ourselves to vulnerability. “In my research,” Dr. Brown says, “the word I use to describe people who can live from a place of vulnerability is wholehearted.” Being wholehearted is a practice—one that we can choose to cultivate through empathy, gratitude, and awareness of our vulnerability armor. Join this engaging and heartfelt teacher on The Power of Vulnerability as she offers profound insights on leaning into the full spectrum of emotions—so we can show up, let ourselves be seen, and truly be all in. HIGHLIGHTS Cultivating shame resilience—the key to developing a sense of worth and belonging. Vulnerability as the origin point for innovation, adaptability, accountability, and visionary leadership. Our emotional armory - how we use perfectionism, numbing, and other tactics to avoid feeling vulnerable. The myths of vulnerability - common misconceptions about weakness, trust, and self-sufficiency. Discovering your vulnerability armor - recognizing what makes us shut down, and how we can change. The 10 guideposts of wholehearted living - essential skills for becoming fully engaged in life. Six hours of stories, warm humor, and transformative insights for living a life of courage, authenticity, and compassion from Dr. Brené Brown.